Ever wondered what Mac Dock and Exposé look like with 150 apps running? Well, wonder no more, friend. Wonder no more. Rest assured, however, everything gets ludicrously tiny. 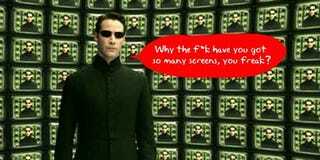 Now, we're not too sure who'd be using 150 apps simultaneously, except for maybe that dude at the end of The Matrix who manages to confuse the crap out of everyone. Damn, he sure was crazy. Anyway, the sight is quite impressive nonetheless, so jump in for a screen shot.